This is “George the Giant”. 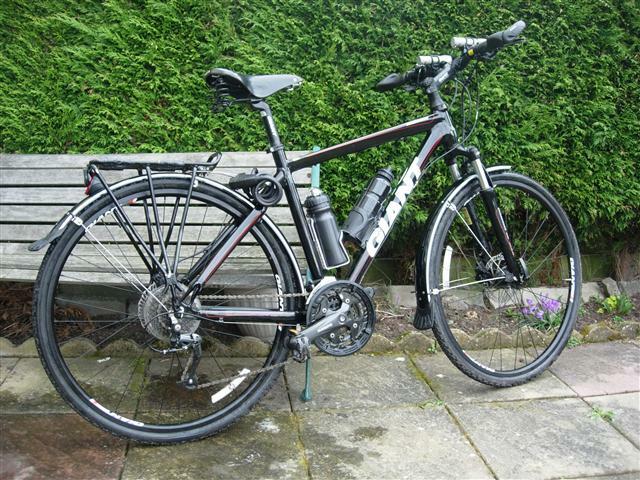 George is a 20″ Hybrid (X road- Sport-Action bike) front suspension, 27 shimano Acera running gear, hydraulic disc brakes , (so good). Since his Birthday he has had some modifications made to him. First I dumped the saddle and fitted a “Brooks Champion Flyer” , for which the design is older than me, with metal springs and leather seat, but oh so comfortable ,(which will come in very useful after 5 plus hours in the saddle).The good thing with Brooks saddles is because they are leather and you treat them with proofide which conditions the leather the saddle over a few months moulds to your shape making them very comfortable to use. After 5 months mine is breaking in well and is starting to soften too my shape (fat arse shape) so should be just about sorted by the time the trip starts. if not it soon will be.! saddle is so comfortable it’s getting better every day , highly recommended . Racks- Front Axion Journey low rider suspension 18 kg limit. In the front panniers will be my “Kitchen” and some of my clothes, bathroom things. On my test run the weight on the front was 3kg each so I have lots more space should I need it, but doubt I will as I will buy fresh produce as Im going. Rear – Topeak Suspension rack 30 kg limit . I intend to split the weight 60/40 for balance and stress on the bike. Trip computer- To record my daily milage/kms, Time, Speed, (not that that matters) Average speed, Calories used, fat burned off, etc. Two water bottles now fitted along with a set of Topeak full mudgaurds , as I don’t want to be covered in crap , should it rain while on my travels!! Ergon GR2 Large grips. –The reason, I broke my right wrist about 10 yrs ago and still get pains in it. Since fitting these , no pain at all, these are so comfortable with a big area for your palms. Strapless toe clips- as I intend to wear my Merrell cross trainers while riding, which will allow me to be comfortable while walking about, sight- seeing as well. Weight – I’ve spent many hours reading blogs, and how some people go to extremes to shave off a few grams ,even cutting the labels out of their clothes to save weight, I’m taking the policy of take what I really need, be comfortable, and go steady. Ive double taped the inner rims, with thick rim tape for extra protection for the the spokes with the extra weight/pressure on the bike. Locks- I’ve got 3 . One big Abus U lock, 1.5 metre 15mm cable, one 1 m combination lock for the panniers.My biggest concern is someone trying to steal the bike, I will be taking every precaution possible about theft, by doing the right things like leaving it where it can be seen, chaining it to a solid object, not leaving gifts! on display, but you can only do so much. The good thing I have found is that bike thiefs are looking for the easy targets and not many touring bikes get stolen as much as every day bikes! if it is stolen then its a claim on the insurance, and a bloody long walk home.! As far as the bike goes ,Im very happy with it. including the changes i have made to him. the only disappointment has been the stand which I dumped after one leg snapped. Im going to buy a good stand which fits to the rear down tube and bracket. you see a lot of them in Holland and Anton and Jenny both have them fitted. You haven’t said anything about tyres . Schwalbe marathon plus are my preferred tyres as we did the nearly 3000 NSCR without any punctures. My new Koga doesn’t have them but I’ll give the Vredesteins a chance to see how they compare. I had a Giant Cypress for the NSCR , inexpensive but it did the job and then I wore it out. Got a Scott but snapped e frame on a very cold day when a dog ran into me , decided then to have a steel frame and DS found me the Koga on line.